Looking for a geospatial job? One of the most popular services offered by the State Cartographer’s Office is our geospatial jobs page. Since 2001, we’ve posted nearly 1,200 jobs geospatial jobs located in Wisconsin or surrounding states. The service has grown over the years as more employers became aware of our site, and technology made it easier for us to proactively seek out opportunities posted elsewhere. Interestingly, our geospatial jobs page is by far the most popular page on our site, accounting for 25% of our total Web site traffic over the last six months. The number of jobs we’ve posted over the last five years has mirrored the overall economy. Looking at our list of archived jobs, the low point was in 2009, with a noticeable gain in 2010 and 2011. 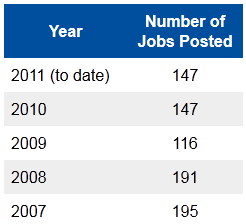 Oddly enough, we’ve posted exactly the same number of jobs in 2011 (to date) as we did in 2010. Sign up for our free e-mail “job alerts” service. After you sign up, each day we will automatically e-mail you any new jobs posted in the last 24 hours. If you are a Twitter user, follow #WI_GeoJobs to receive instant updates when we post a new job. Add our GeoJobs RSS feed to your favorite news reader. Employers, send us your jobs! Have a job to post? Send your announcements to us at sco@wisc.edu. We typically post the job within 1-2 business days, and there is no charge. Wherever you may be in your career or job search, we invite you to check out the SCO geospatial jobs page!